Crowds walking. Undistinguished conversations. People running out of time. That is just another common day in a Toronto subway station – and in subway stations all around the world. But there is always a chance to hear something magical happening: that musician that is always sympathetic and plays songs from the heart to make other people’s days better. Sometimes they are ignored, sometimes someone throws coins. But there is always a smile for everyone that passes by. 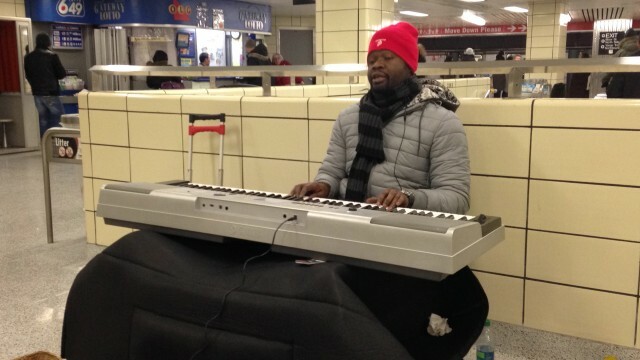 Few people know that playing in subway stations requires a $200.00 license, that only seventy-five licenses are issued – every three-year period – and one of those licenses is owned by an honorary member. To get yours it is necessary to present a medley of three songs in a seven-minute audition, in which there are qualified judges to approve you: some of them may be media celebrities, representatives from the Royal Conservatory of Music or even music educators. The musicians can play original songs or covers, but only hand-held instruments are accepted. There is no requirement to be part of this team: maybe you are a former member of a famous band or you are just searching for a new life. In its history, the TTC Subway Musicians Programme had two musicians that had already won Juno Awards: Adam Solomon, for his African Guitar Summit Albums; and Roger Ellis, former lead guitarist of Edward Bear, a band that had an over-a-million-copies single released called “Last Song”. In one corner of Bloor Station two men are playing: Andrei, 55 years old, in his 22th year of the Program, and Andre, 62 years old, only in it for around two years. “Sometimes we play alone, sometimes together. That’s how we do it,” says Andrei, with his violin. Andre nods and keeps playing his guitar, and people pass smiling and enjoying the music. 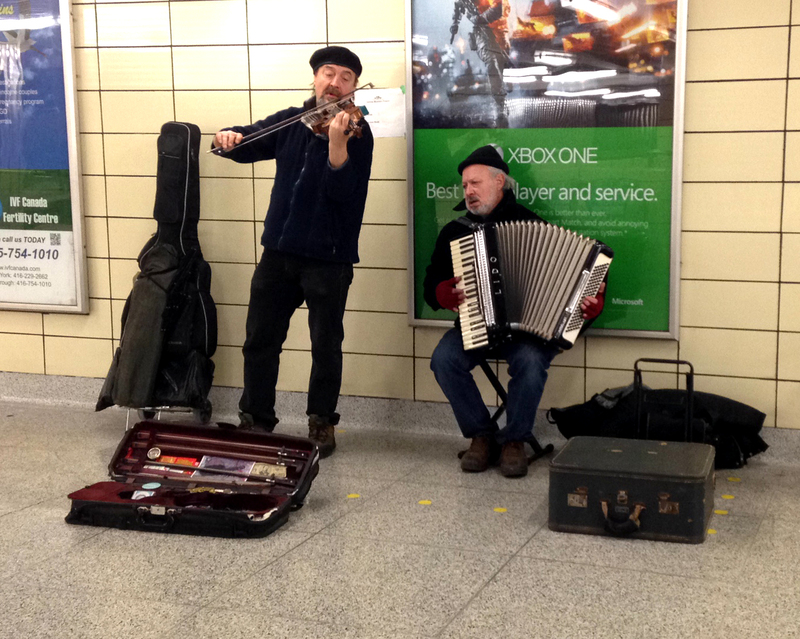 The Toronto Subway Musicians have a 3-day rotating schedule of stations to play – the service can be provided only in 25 places. When two musicians choose the same place, they can play together and divide the money. The next auditions will be scheduled in 2015, over three days at the Canadian National Exhibition (CNE). The public is allowed to watch the performances – an average of 200 musicians play per audition. If one of the licensed performers withdraws from the programme, the next highest scoring musician will take their place. And they will keep making others’ days feel magical – whether people pay attention or just use the transport running out of time.